Brantley Gilbert’s “Let It Ride” spring tour marks the christening of the new Meyer Sound LYON linear sound reinforcement system from Nashville-based Digital Console Rental (DCR). LYON incorporates the technology of the LEO Family in a more flexible and compact package, and extends the advantages of highly linear self-powered systems to a larger range of venues and applications. For the larger arenas with capacities up to 20,000, the system comprises arrays of up to 12 LYON-M main line array loudspeakers and four LYON-W wide-coverage line array loudspeakers. For the smaller venues, the system is cut back to 12 LYON loudspeakers total in each array. 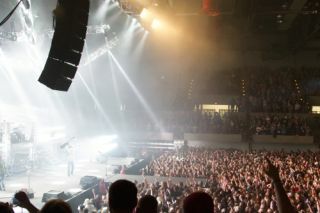 The tour also carries 24 MICA and 12 MINA line array loudspeakers for out fill and front fill, respectively. Six 1100-LFC low-frequency control elements in cardioid or end-fired configuration provide low end, while a Galileo® Callisto™ loudspeaker management system with two Galileo Callisto 616 array processors and a Galileo 616 processor handles drive and optimization. The tour audio package also includes Avid VENUE Profile consoles for FOH and monitor, while the band uses Shure PSM 1000 personal monitoring systems. A Shure UHF-R wireless microphone system with a KSM9H mic capsule is used for Gilbert’s vocal. DCR also supplied the tour’s lighting and video systems, with overall show design by Howard Jones. DCR’s system techs are Chris Wilhelm and Patrick Johnston.